Taking your student’s vehicle in for a check-up and servicing is one of the most important things that you can do to make sure that the new school year goes smoothly. The last thing you want is an unexpected car repair. Making sure that your students car is safe should be your top priority. It also sets a good example for them about how to take care of a vehicle properly and avoid high costs when something does go wrong. 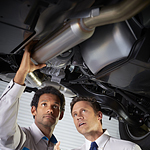 Stop by Bill Kidd's Volvo Cars and have your student’s car serviced today. Then you will be sure to have everything on the list.